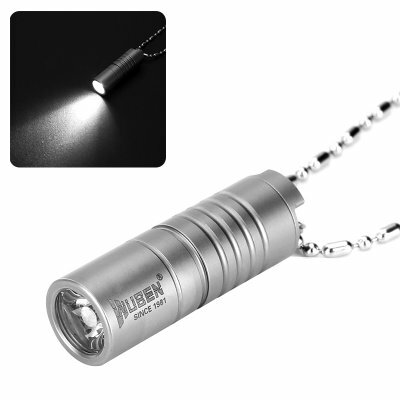 Successfully Added Wuben G337 Mini Flashlight - CREE LED, 130 Lumen, IPX8 Waterproof, Fashionable Neck Chain, Titanium Alloy Body to your Shopping Cart. With the Wuben G337 mini flashlight, you will always have a source of light at hand. Build from a durable titanium alloy this LED flashlight is made to withstand the most demanding of environments. Featuring a stylish design and coming with its own neck chain this mini flashlight can be attached to your bag or be worn as a fashionable necklace – ensuring that you’ll always be able to carry your Wuben mini flashlight along and will never be left in the dark again. Its IPX8 waterproof rating additionally allows you to wear or carry along this beautiful mini LED no matter the weather conditions as rain, snow, nor fog, will stop this beauty from shining. Although small in size this mini LED flashlight packs some serious power for its size. Featuring two different light modes this mini torch is capable of emitting up to 130 lumens of light, enough to illuminate your near surroundings. Packing a 10180 Lithium-ion battery that is easily rechargeable through the flashlight’s USB port in just 1 hour, this energy efficient LED torch has a stunning continuous usage time of up to 6 hours. Featuring a high-quality CREE XP-G2 LED light the Wuben G337 mini flashlight provides you with a service life up to 50.000 hours. Along with its durable and waterproof titanium alloy body, this mini LED flashlight provides you with year’s worth of light. With this flashlight necklace at hand you can be assured that, never again, you will be lacking the light needed to get your tasks done. Perfect for in emergency situations or to have on you while camping – this fashionable mini flashlight can be conveniently carried along at any occasion. The Wuben G337 mini flashlight comes with a 12 months warranty, brought to you by the leader in electronic devices as well as wholesale electronic gadgets..
Arabic: - مصباح LED ميني - Chinese Simplified: - LED 迷你手电筒 - Czech: - LED Mini svítilna - Dutch: - LED Mini zaklamp - French: - Mini LED lampe de poche - German: - LED Mini-Taschenlampe - Hebrew: - פנס LED מיני - Hindi: - एलईडी मिनी टॉर्च - Hungarian: - Mini LED-es zseblámpa - Italian: - Mini LED torcia - Japanese: - LED ミニ懐中電灯 - Korean: - LED 미니 손전등 - Malay: - Lampu suluh LED Mini - Norwegian Bokmål: - Mini LED lommelykt - Romanian: - Lanterna LED Mini - Russian: - Мини светодиодный фонарик - Spanish: - Mini LED linterna - Thai: - ไฟฉาย LED ขนาดเล็ก - Turkish: - LED Mini el feneri - Vietnamese: - Đèn pin LED Mini.